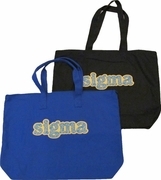 Bag Color: choose a colorRoyal Blue Sorry, this item is currently out of stock. So jazzy! Zebra print letters adorn these cotton twill bags! Each zips close and has a zippered pocket inside. Measuring about 18" wide, 13" tall and 5" deep, these bags can carry it all! *Sorry, we are out of stock of the black bags.